Today's learning professionals are under pressure to address ever-evolving skills needed in their organizations, and they are being asked to do so with limited resources and time. 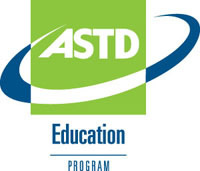 This ASTD program provides the roadmap for creating high-impact solutions that address these needs by combining various learning platforms, methods, and formats to motivate learners, produce real results, and increase productivity. After this workshop, participants will be able to take immediate steps to design blended learning solutions using the tools and action plan provided. Click here to register on the ASTD Store. When you register, please type in the ASTD National ChIP Code: CH7039 so our Fort Worth/Mid-Cities Chapter will get credit in the Chapter Incentive Program!